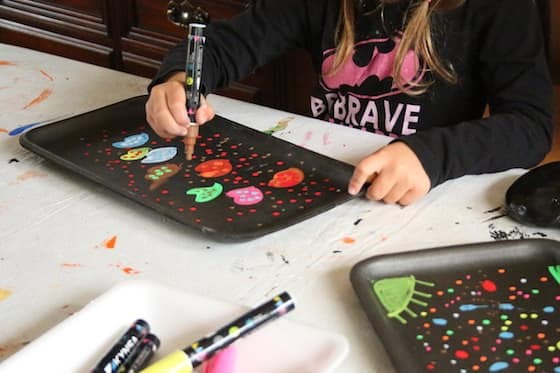 If you’re looking for a no-mess art activity that’s easy to set up and fun for kids, try making art with liquid chalk markers and styrofoam produce trays. 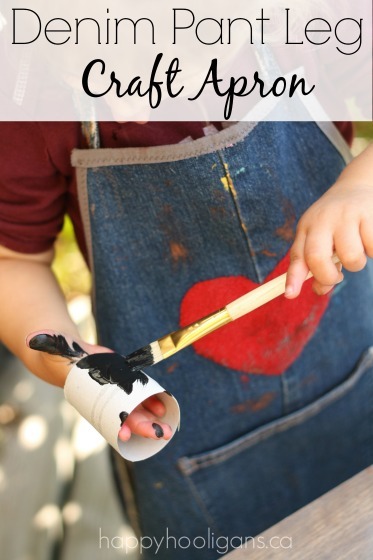 This art activity is perfect for those times when your kids want to get creative, but you don’t have time for a complicated craft or art project. 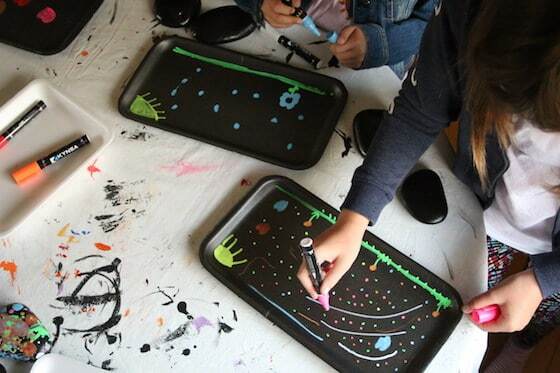 It only requires two supplies: liquid chalk markers and a styrofoam produce tray. 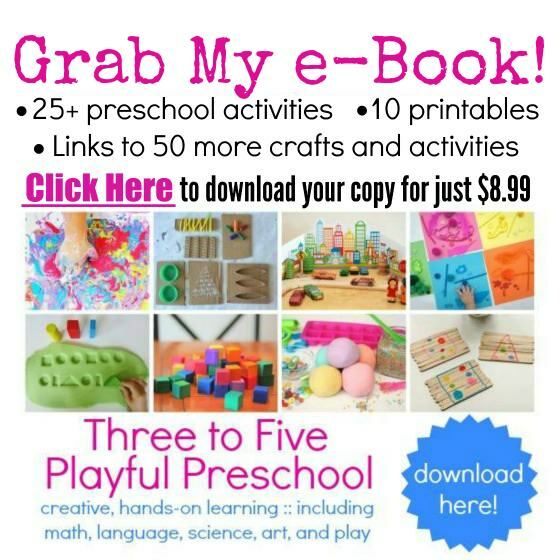 You can set this art activity up in seconds and there’s virtually no clean-up, so it’s the perfect craft when you’re short on time. Think: at the end of the daycare day when kids are waiting to be picked up, or in between other activities during your day. 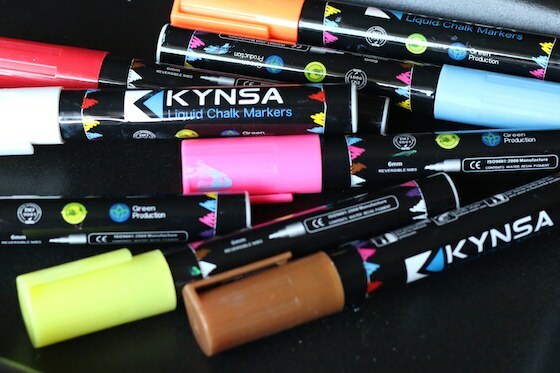 The hooligans love liquid chalk markers. 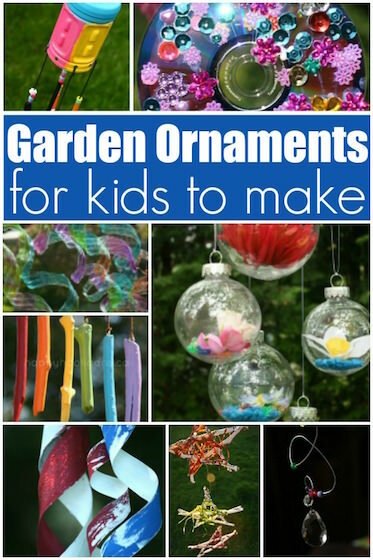 They’re really bright and slick, and fun to use on a variety of surfaces like glass, mirror, stone, wood. etc. Check out our “Chalk Rock Paperweights” and our Liquid Chalk Bookmarks to get an idea of how we’ve used our chalk markers in the past. 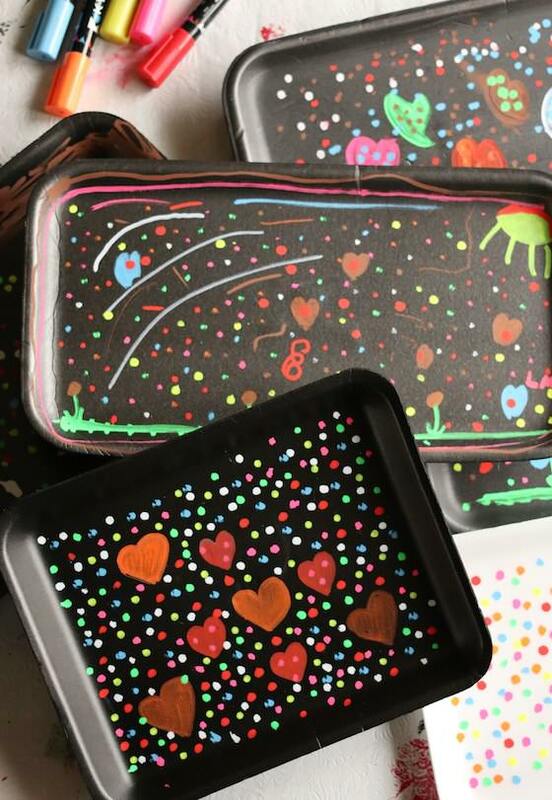 Today we’re using our liquid chalk markers to make art on styrofoam produce trays. 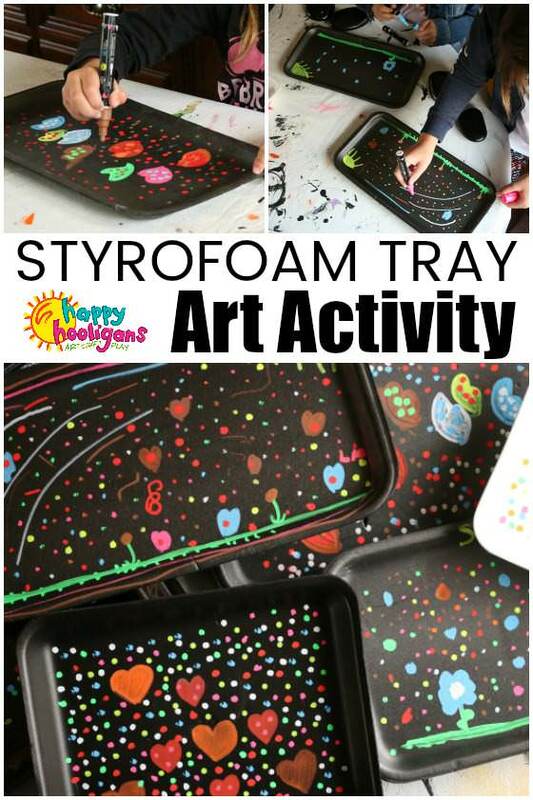 Styrofoam produce trays are great to use for kids crafts. 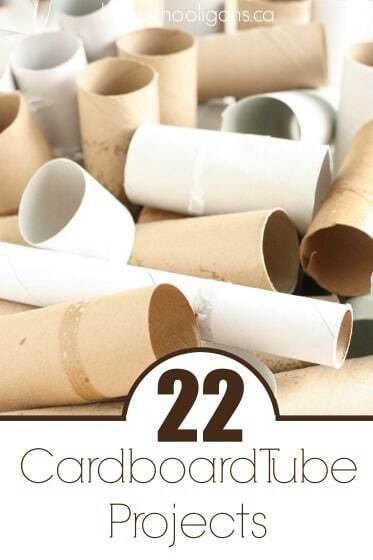 I always have a huge stash of them in the craft cupboard because they can be used in so many ways. as a salt tray for early-writing practice. Note: Sanitize the trays first! 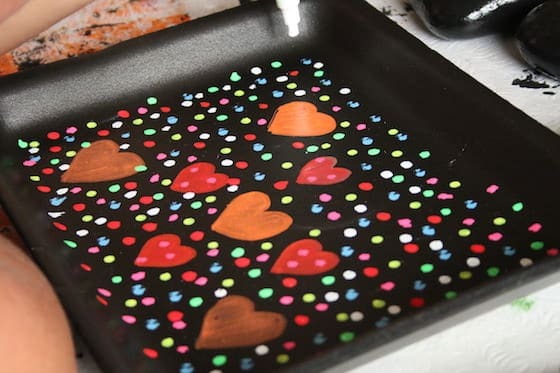 I always sterilize our styrofoam trays in the dishwasher before crafting with them so they’re clean and safe for the kids to handle. 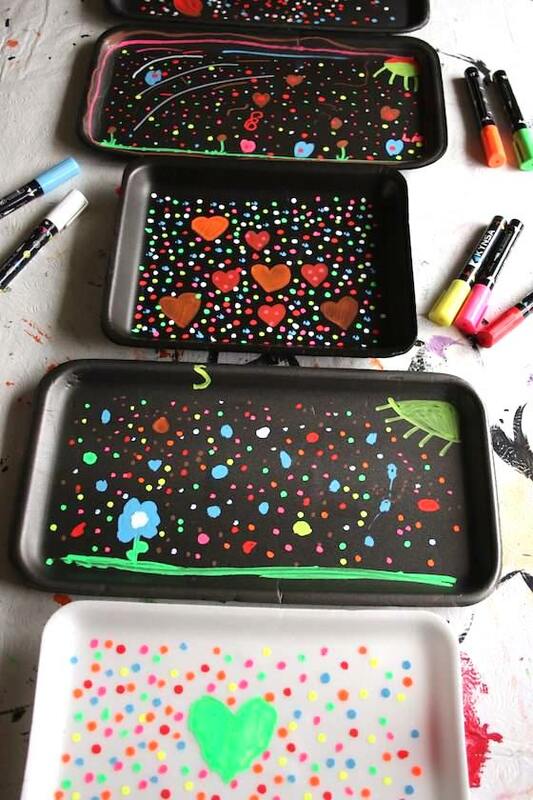 The chalk markers glide nicely on the produce trays, and the colours show up really well. 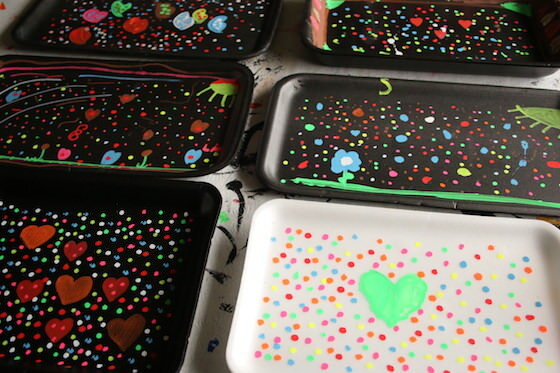 The contrast between the bright ink and the black styrofoam trays was wonderful, but even the white trays worked well. The kids drew dots, shapes and designs and even created some scenes with trees, flowers, suns and people. 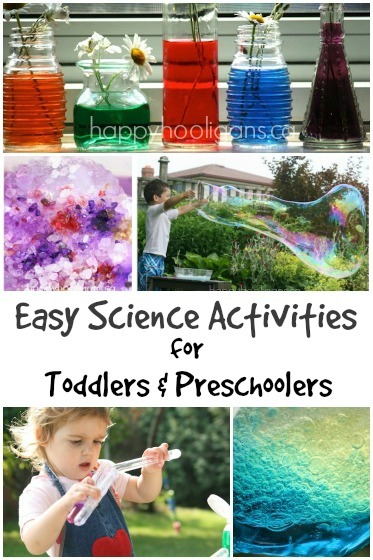 They really enjoyed this simple activity and made 2 or 3 pieces of art each. They were very focused as they worked. I love how an art activity always calms and relaxes us. 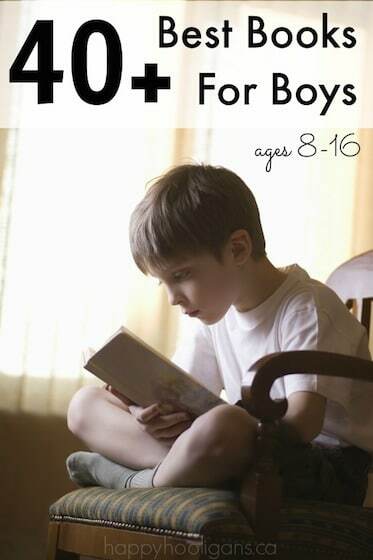 It’s a great way for kids to shift into a quieter gear in between busy periods of play.